After defeating the Kingston Frontenacs 8-3 to close out the regular season OHL schedule on Sunday afternoon, the Ottawa 67’s added two more big accomplishment to a season that has been full of them. 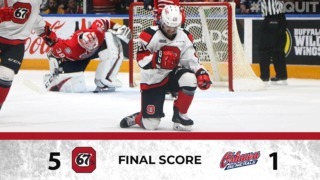 With that win, in front of another loud crowd of 5,505 at The Arena at TD Place, the 2018-2019 edition of the 67’s won more points this season than any other in the club’s decorated history. The Barber Poles also equaled a franchise record of 50 wins in a season. 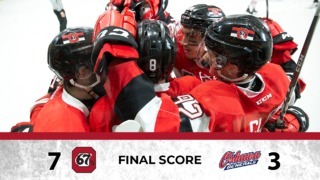 Led by a Sasha Chmelevski hat trick — including his 100th career OHL goal — and a five-assist effort from Austen Keating, the 67’s rolled to a result that is sure to fire them up ahead of their playoff-opening game on Friday against the Hamilton Bulldogs. Tye Felhaber, with his 59th of the year, and Graeme Clarke, both had a goal and a pair of assists against the Frontenacs, while goalie Cedrick Andree won his 33rd game of the season to finish an impressive season with a record of 33-5-2-2. Marco Rossi and Lucas Chiodo, both with their 29th goals of the year, and Merrick Rippon, with his sixth, also scored for Ottawa in this one. 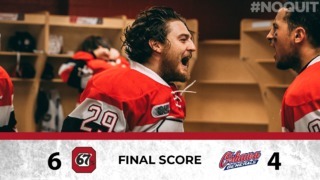 Icing one of the best teams in franchise history, the 67’s will begin their quest for an OHL title and Memorial Cup on March 22 at 7 p.m. at The Arena at TD Place when they host the Hamilton Bulldogs. Click here to get your playoff tickets now. On winning 50 games … “It’s special. We don’t want to look back right away but down the road we will look back at what was done here and we’ll be really proud of it. We’re very fortunate to have a group of players like this. They’re not just talented but they are committed and they work hard. Tonight, we really saw our team. With nothing to win, we could come here and have a way different night but the guys came in and played hard and played the right way. We’re proud of them. On scoring his 100th goal … “I always had confidence in myself, but I never put a number on it. it’s really humbling to know I’ve done a good job in the last four years and it’s going to be something special to look back on. The 50 wins is the first time in Andre Tourigny’s coaching career that he was won 50 games in a season. With a hat trick on Sunday, Sasha Chmelevski tied his career best for goals with 35, set last season. 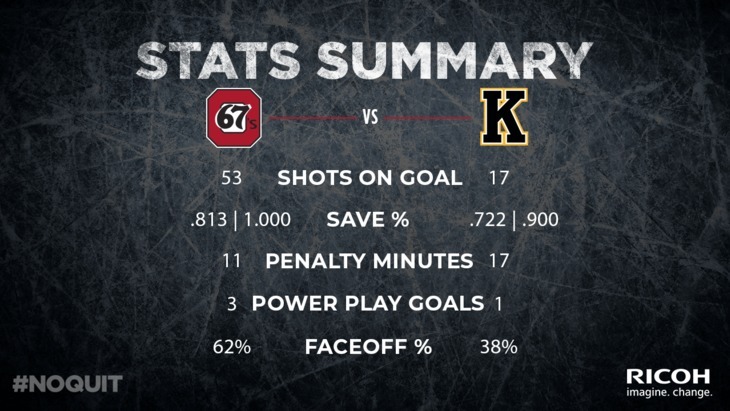 The 67’s shot often and from everywhere in this one, firing 53 pucks on the Kingston goal. The 67’s were dangerous on the powerplay on Sunday, converting on three of six chances. Six Ottawa players had at least five shots in this one, with Lucas Chiodo leading the way with seven.